Essential Property Maintenance is a full service landscaping and property care contractor based out of Calgary, Alberta. 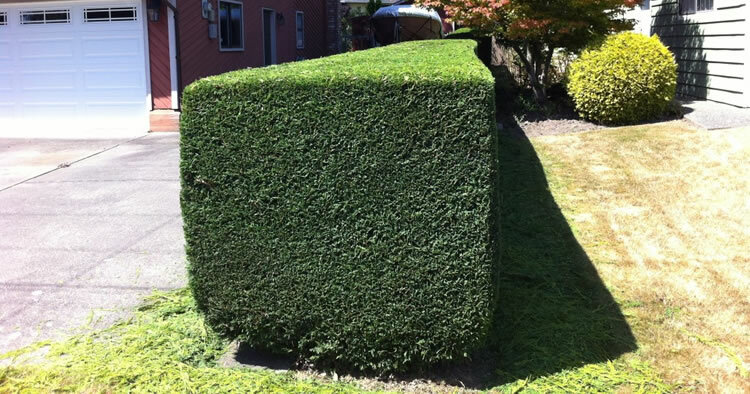 We specialize in the care and maintenance of privacy hedges, trees, and shrubs for our customers’ homes, residential developments such as townhomes or condos and commercial properties. Schedule Your FREE Calgary Tree and Hedge Pruning Estimate Today! In order to keep trees, shrubs and hedges looking their best with healthy new, uniform growth the old dead, and dying branches must be trimmed back and pruned at least once or twice a year, sometimes more depending on the species of tree or shrub and the weather. From pruning a privacy hedge back into a uniform shape to maintaining all of the trees on your property our team of tree care experts will be able to keep your trees healthy and looking great. There are limits to the tree work we can do for our clients and it’s usually limited to what we can “safely do???. We can only prune and trim trees and hedges that we can reach with a ladder. If a ladder is not possible we work with a trusted local arborist who can take care of any dangerous tree trimming and we can organize and supervise the process.